In recent years, the automotive industry has been in a crisis. Cars are safer, more efficient, and more powerful than ever, not to mention more technologically advanced in regard to both infotainment and safety features. Automakers can get more power out of a drop of fuel than ever before. So where is the crisis? There has been a serious lack of true “drivers’ cars.” These are sports cars that put taking a corner over straight-line performance. Thankfully cars like the 2016 Subaru BRZ exists to prove that the car for the pure driving enthusiast has not gone the way of the dodo. The BRZ was conceived as a joint venture between Subaru and Toyota. The two companies co-developed the boxer engine using Subaru’s characteristic 4-cylinder boxer engine layout. As development of the car progressed, Subaru also got involved with the chassis and gearbox development. It is sold as the Toyota 86 in Asia, South Africa, South America, and Australia; as the GT 86 in Europe; and as the Scion FR-S in the U.S. and Canada. But for Subaru, it's known as the BRZ the world over. The name BRZ stands for Boxer engine, Rear-wheel drive, Zenith. No matter the name, they are built in a Subaru factory. The Subaru BRZ features an instantly recognizable sports-car shape, with a long hood and sloped rear window ending in a short rear deck. There is a mix of old and new aesthetics in this car, as the rear side windows hearken back to older Japanese coupes, while the front has a very modern, aggressive look. The BRZ separates itself from the Scion model with a more pronounced rear spoiler and a lower front end that visually ties it to the iconic Subaru WRX. Subaru keeps things simple with the BRZ. The trims are Premium and Limited, and both feature fog lights, LED headlights, and 17-inch alloy wheels wrapped in summer performance tires. Like the exterior, the interior is a no-nonsense affair. It may include lots of plastic, and it doesn't have the latest in-car creature comforts, but one must not approach the BRZ like a performance-oriented car. One should look at the BRZ like a fully enclosed, all-weather motorcycle. This car was designed by true driving enthusiasts for driving enthusiasts. The toggles that the driver can access best are those that pertain to driving the car. The best feature of the interior is the standard bucket seats that bolster the driver in hard cornering. The driver and front passenger each get one, though the BRZ technically has seating for four. The Premium comes standard with features like a no-nonsense 6-way manual adjustable driver’s seat. If you want heated front seats, you’ll have to up to the Limited model. You’ll also have to up to the Limited to get features like dual-zone climate control, leather seats, and keyless access with push-button start. The BRZ also features Subaru’s Starlink in-car infotainment system. The 6.2-inch touchscreen features controls for the stereo, navigation, and Bluetooth hands-free calling. This feature rockets the once-spartan BRZ interior into the cutting edge for user interfaces. The advantages of Subaru’s 4-cylinder boxer engine layout are optimized in a vehicle like the BRZ. As the name suggests, two pairs of cylinders are arranged flat and opposing each other, with the two banks “punching” at one another. This 2.0-liter engine makes an even 200 horsepower without the use of a turbocharger. Power is sent to standard rear-wheel drive through a 6-speed manual transmission or an available 6-speed automatic transmission with steering-wheel-mounted paddle shifters. But the drivetrain is only half the story with the BRZ. McPherson front struts and rear double-wishbones comprise its sport-tuned suspension. A Torsen limited-slip differential can offer various amounts of traction, depending on whether you're trying to get home safe or get around the track with a smile on your face. With the manual transmission, the BRZ returns fuel economy of 22 mpg city/30 highway/25 combined. The automatic transmission achieves 25/34/28. 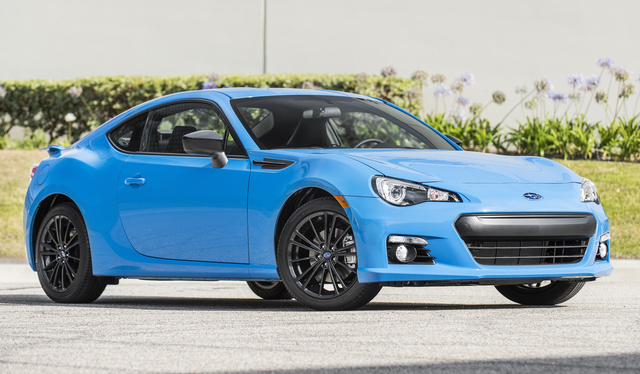 Base MSRP for the 2016 Subaru BRZ is $25,395. If you want added goodies like heated leather seats, climate control, and push-button start, the Limited starts at $27,395. 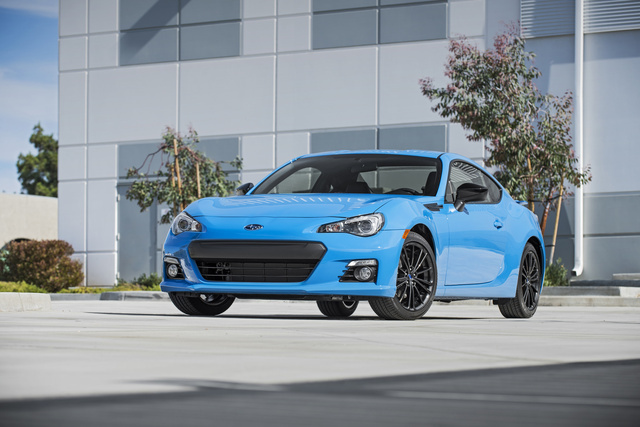 If you’re looking for a truly unique Subie, a BRZ Hyper Blue edition is being offered. It features the iconic blue of Subaru’s rally cars and a wealth of special touches (many blue). Act fast, though, because the Hyper Blue costs only $27,690, and Subaru is making only 500 examples. Sure, you could settle for another anonymous daily driver and take the rat-race without excitement or passion. Or you could opt for a Subaru BRZ and let every day be an opportunity to drive like you mean it. Pulling up in a BRZ signals to the world that you're not ready to resign yourself to being just another face in the crowd and that you intend to keep the enthusiast dream alive! What's your take on the 2016 Subaru BRZ? Users ranked 2016 Subaru BRZ against other cars which they drove/owned. Each ranking was based on 9 categories. Here is the summary of top rankings. Have you driven a 2016 Subaru BRZ? How Much Would It Cost To Put A Small Spoiler On A Subaru BRZ? I'm interested on putting a small spoiler on my 2016 Subaru BRZ for style, how much would that cost for everything?